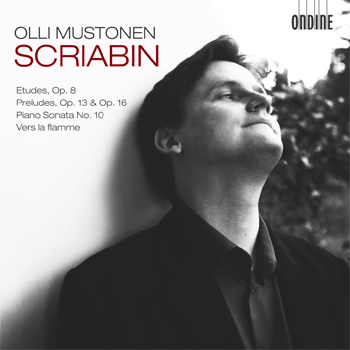 This CD features Olli Mustonen with piano works by Alexander Scriabin, which have become his signature pieces in recital concerts. The virtuoso sets of Etudes and Preludes cover a wide range of late-Romantic expressions, from heroic to religious, ecstatic to melancholic. The Sonata No. 10 is regarded as one of Scriabin's greatest works. The collection culminates with the pianistic tour-de-force of Vers la flamme, an astonishing piece famously championed by the late Vladimir Horowitz. Olli Mustonen has been hailed by The Sunday Times as, "a living dream of pianism, having broken through an expressive barrier that other players do not know exists." On this recording, he performs on his instrument, a Fazioli F278.